Dead Eye is the fourth Gray Man series of novels and is narrated by Jay Snider who nails his performance. Court Gentry is taking a break while recuperating from the happenings in Ballistic when a man approaches him who has same training as Court. I found a lot of this story to be obvious, there were very few surprises for me, but that may have been Mark Greaney’s intention when he wrote it. It may have been his intention to keep the story very straightforward with the action flowing along at a steady pace. I really like the combination of characters in this novel. The killer named Dead Eye is contrasted by Ruth the Mossad agent. Dead Eye thinks his skills match Court’s point-for-point and his overconfidence is his downfall. While Ruth’s quick evaluation of who Court really is and the risks she takes to do the right thing in all things makes her a polar opposite to Dead Eye. I think it is great story telling technique. Ex-CIA master assassin Court Gentry has always prided himself on his ability to disappear at will, to fly below the radar and exist in the shadows – to survive as the near-mythical Gray Man. But when he takes revenge upon a former employer who betrayed him, he exposes himself to something he’s never had to face before. Code-named Dead Eye, Russell Whitlock is a graduate of the same ultra-secret Autonomous Asset Program that trained and once controlled Gentry. But now, Whitlock is a free agent who has been directed to terminate his fellow student of death. He knows how his target thinks, how he moves, and how he kills. And he knows the best way to do the job is to make Gentry run for his life – right up until the moment Dead Eye finally ends it. ©2013 Mark Strode Greaney (P)2013 Audible, Inc. 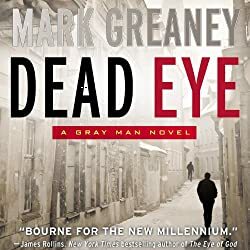 I rate Dead Eye a 7 out of 10 and recommend it to anyone who enjoys spy and action novels. Ballistic is easily my favorite Gray Man novel. The flashback story about how he met Eddie and formed a deep friendship with him is amazing writing. 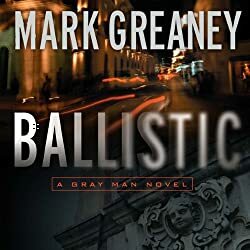 The pictures Mark Greaney paints of the large gun fights in this story blow me away, I really felt like I was watching it all inside my head and could picture everything like I was watching it in a movie theater or in a really great video game. In fact I was playing the PC video game Far Cry 3 at the same time I was playing this game. I think the Gray Man really affected how approached playing the video game and made it an even better experience. There are a couple of places in the game that loosely fit in with some of the locales in the book, that combination took both the book and video game to another level for me. 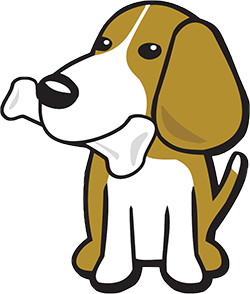 For the third time in a row Jay Snider hits a home run and brings all of the characters to life. I was amazed to learn that Jay Snider has recorded 112 programs on Audible, that is an amazing body of work and I look forwarded to listening to more of them. Ex-CIA assassin Court Gentry thought he could find refuge living in the Amazon rain forest. But his bloody past finds him when a vengeful Russian crime lord forces him to go on the run once again. Court makes his way to one of the only men in the world he can trust – and arrives too late. His friend is dead and buried. Years before, Eddie Gamboa had saved Court’s life. Now, Eddie has been murdered by the notorious Mexican drug cartel he fought to take down. And Court soon finds himself drawn into a war he never wanted. But in this war, there are no sides – only survivors…. ©2011 Mark Strode Greaney (P)2011 Audible, Inc. I rate this book a 9 out of 10 and highly recommend it to any fans of spy and action stories. 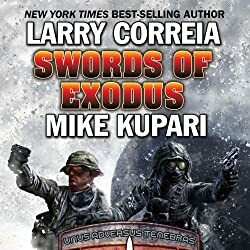 This is the second book in Larry Correia and Mike Kupari’s "Dead Six" series and it packs all of the punch and kick as the first Dead Six book. Holy Cow! I am loving these books. Lorenzo and Valentine are such great characters and the team of Correia and Kupari keep adding more and more depth to them. I really love these characters. In this story the ancillary characters step-up in a big way. We get to learn more about them as they take on larger roles in the story. It is characters like these that make stories raise above being just good to being GREAT! Enter Lorenzo, thief extraordinaire. Lorenzo is now retired, happily married, and living in paradise. His Achilles heel: an FBI-agent brother who has gone missing – disappeared into the stronghold of warlord Jihan. Exodus promises to give Lorenzo his chance to rescue his brother if and only if Lorenzo will perform one service for them: break Michael Valentine out of a captivity from which no one has ever emerged alive. And if Lorenzo can accomplish that – well then, the Crossroads awaits the sword of Exodus. ©2013 Larry Correia, Mike Kupari (P)2014 Audible Inc. I rate Swords of Exodus a 9 out of 10 and recommend it to anyone who love a good action story. I am a spy/thriller rampage! 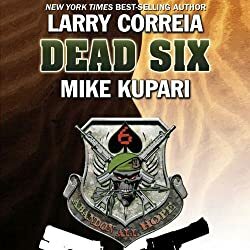 Dead Six is another excellent book from Larry Correia along with Mike Kupari. As with all Larry Correia stories the characters in this one are absolutely amazing. With two lead characters, Valentine and Lorenzo, the story bounces back and forth between the two with amazing timing leaving me on the edge of my seat time and time again. An amazing juggling act that could have easily fallen apart at any time but Larry and Mike keep all of the balls in the air throughout the entire story. Such great writing. Bronson Pinchot turns-in yet another amazing performance bringing all of the characters to life. I did have a few flashbacks to other books I have listened to recently that were also narrated by Bronson, but it wasn’t all that distracting, more like hearing from a long lost friend. Michael Valentine, veteran and former member of an elite private military company, has been recruited by the government to conduct a secret counter-terror operation in the Persian Gulf nation of Zubara. The unit is called Dead Six. Their mission is to take the fight to the enemy and not get caught. Lorenzo, assassin and thief extraordinaire, is being blackmailed by the world’s most vicious crime lord. His team has to infiltrate the Zubaran terrorist network and pull off an impossible heist or his family will die. When Dead Six compromises his objective, Lorenzo has a new job: Find and kill Valentine. As allegiances are betrayed and the nation descends into a bloody civil war, Lorenzo and Valentine must face off. Two men. Two missions. Only one will win. I rate Dead Six a 9 out of 10 and recommend it to fans of spy/thriller and action novels.